This is an intro to a series of what will be regular meal plan posts! It started as something to help my family stay on track with our own goals around meals and our food budget but the more I've worked on it, the more it's seemed like this is something that would be useful for others as well. The recipes I'll include come from recipe developers, nutritionists, and cookbook reviewers that I love and in a lot of cases have been following on the internet for years. Many of the recipes are ones that have been in heavy rotation for us for awhile, and I'll include info around any modifications or adds that we've found to be helpful or tasty. 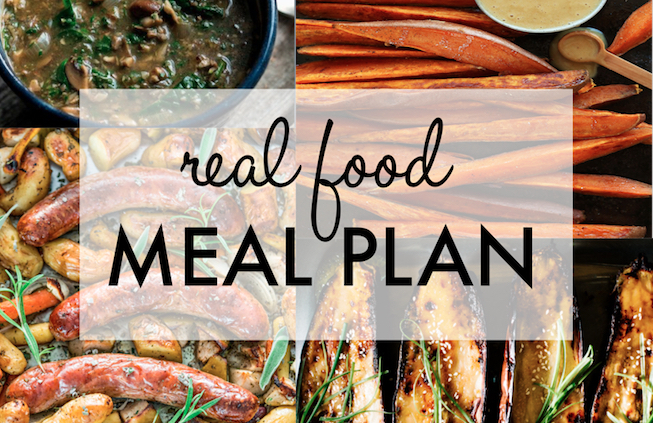 What works for my family and our schedule might work for yours or it might now - I'm going to provide a little detail below about how meal prep and our evenings shake out around here so you can have a clear idea of how we manage to follow meal plans like these. I know that for lots of people just getting started with cooking the majority of their meals at home finding the time can seem impossible. What we do won't necessarily work for you but it might help you imagine what could work. We're a family of three - my partner Clay, myself, and our kid June who just turned one in October. Clay works in a co-working space that is a 20 minute walk from our house so he usually gets home around 5:20 PM. June is in childcare three days a week while I'm at my office seeing patients; on those days I get home at 4:45 PM. On Tuesdays, I work an evening shift but am home during the day. On Fridays, I work from home and hang out with Junie. We are all home together on the weekends unless I'm running a workshop somewhere. When I get home after being at work I usually start working on food prep right away. June will hang out in the kitchen with me and look at books or play at her table. This stage of cooking looks a lot like this, chop-chop-ch "Oh, you want up? Ok, just one moment. Would you like one of these carrots? Oh, you want down? No problem. You need me to sit down with you? Ok, hold on". In other words, pretty much nothing gets done (I still try!). When Clay gets home he takes June and sits down with her for dinner while I continue with the cooking. Sometimes our roles are reversed or Clay will take over after I've gone to give the kid for a bath. At the moment we're in the habit of feeding June leftovers from the dinner we've had the night before alongside things we've prepared especially for her. For now this is working for us because of how early she goes to bed - who knows how this will change as we go forward and want to focus more on eating together as a family.